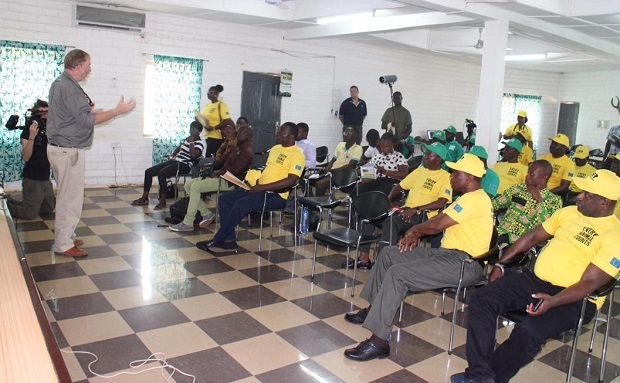 The European Union Delegation to Ghana has organized training on Wildlife Census for the staffof the Mole National Park in the West Gonja District of the Savannah Region. The objective is to train an operational team of Wildlife Division (WD) staff, in aerial wildlife count in order to implement an aerial survey, to train staff from Wildlife Division to enhance the quality organization, management and spatial presentation of data being collected by field staff during patrols and monitoring duties. The training will also enable staff to conduct aerial wildlife counts in Mole National Park to generate and validate data on key wildlife species.The project is a collaboration between Bushskies,aerial Photography, of Namibia, Forestry Commission, Wildlife Division, and Mole National Park. Mr. Roberto Schiliro, Team Leader, Infrastructure and Sustainable Development who addressed journalists on behalf of the EU Ambassador said the project includes the capacity for making an inventory of biodiversity and for assessing the economic value of ecosystems, integrating environmental issues in national planning strategies for poverty reduction and macroeconomic policy instruments; and monitoring progress in turning policies into action. He explained that it will contribute for the revitalization of the biodiversity to create awareness on the preservation of the wildlife and to show to citizens the beauties and the opportunities of protected areas. Mr. Schiliro said protected areas are important for preserving biological diversity adding that they are major economic assets and sources of formal employment in management, tourism and associated private enterprises. ‘These opportunities arise not only inside the protected areas but also in their buffer zone and neighbouring areas,’he said. The Leader of the team stated that the EU considers the project could kick start a major sustainable strategy for the preservation of the wildlife of the Northern Region in Ghana. He assured that the EU remains committed to the preservation of the biodiversity and ecosystems which is the small step that can foster the sustainable development of Ghana.